John Christopher “Johnny” Depp II was born on June 9th, 1963 in Owensboro, Kentucky to mother Betty Sue Palmer and father John Christopher Depp. His father was a civil engineer and his mother a waitress. He has one brother and two sisters and his family is formed from German, Cherokee and Irish ancestry. While growing up Johnny’s family moved frequently through different states, it is said that his family lived in more than 20 different locations until they finally settled down in Miramar Florida in 1970. Depp also states that a lot of turmoil was found in his family which caused him great pain and as an effect he used to inflict wounds onto himself. During his first marriage, Depp was introduced to actor Nicolas Cage by his wife and was advised to pursue a career in acting. His acting career began to gain acclaim in 1987 when he played the lead role in a Fox television series called ‘21 Jump Street’. At this time, his exposure was limited and he needed a way of building his repertoire. This TV series helped to propel Johnny Depps image as a Teen Idol during the late 1980’s, an image which he was notably uncomfortable with which forced him to want to play in roles that he thought complimented his deeper artistry. In 1984 Depp played his first major role as an actor in the horror film called ‘A Nightmare on Elm Street’. In 1986 he appeared in the movie Oliver Stone’s Platoon as a Vietnamese-speaking private. Johnny Depp went on to play roles in movies such as Edward Scissorhand, Sleepy Sparrow and his most famous role in the sequel Pirates of the Caribbean where he plays the character Jack Sparrow. The film’s director Gore Verbinski has said that Depp’s Jack Sparrow character closely resembles Depp’s own personality. He was nominated for an Academy Award for his performance in the film. He also received another nomination for Best Actor Oscar in the film Finding Neverland. 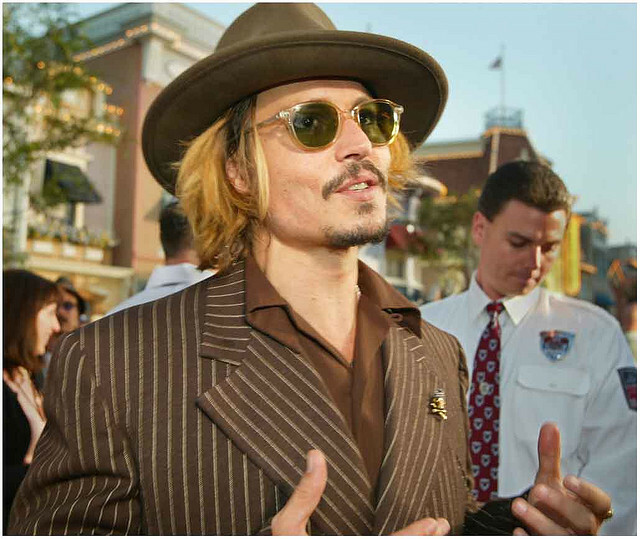 Johnny Depp has also gained acclaim for playing in roles that depict real life public figures such as Joseph D Pistone in Donnie Brasco, Edward Wood Jr in Ed Wood and George Jung in Blow. Depp is also known as a musician. In 1997, he recorded a solo album called, Be Here Now, where he played the slide guitar on the tracks such as Fade Away and Oasis. He also played the acoustic guitar in the movie Chocolat and on the soundtrack Once Upon a time in Mexico. On December 24, 1983, Depp married Lori Anne Allison who was his makeup artist and the sister of his bands bass player. The marriage only lasted two years and in 1985 Depp and Allison filed for divorce. In 1985 while on the set of the short film ‘Dummies’ Depp met Sherilyn Fenn and soon after started to date until they became engaged. In 1998, Depp dated Kate Moss and Vanessa Paradis. Depp and Paradis have two children together Lily-Rose and John ‘Jack’ Christopher Depp III. Depp is not currently married but his family move between his many estates. Johnny Depp and Paradis owns a wine making facility in a vineyard in Plan-de-la-Tour north of San Tropez where he grows his own grapes and makes his own wine. He has a particular interest in French Wines and favors Bordeaux wines, Chateau Calon Segur, Chateau Cheval-Blanc & Chateau Petrus and the Burgandy Winde Domaine de la Romanee Conti.